I am on my own for dinner, bath time, and bedtime three nights in a row this week. 'Tis the season for evening public meetings at Henry's work, which means this will be the norm for at least the next two months. Strangely, I am more--not less--productive, when I am the only parent in the evenings. When I know that Henry is coming home at 4:30, I count down to the moment. Only another two hours until he's here and can watch HP! I'll just wait until then to clean the kitchen and start dinner. That way I'll be able to listen to NPR in peace and have some time to myself. As the day wears on, piles of clothes, dishes, and toys accumulate in every room in the house. In the late afternoon I hand-off childcare duties to Henry and either make headway on the mess or take a much needed break. HP helping sort the laundry. 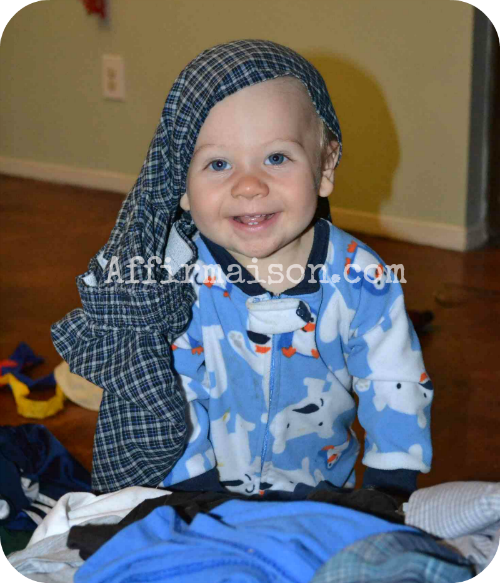 I would say that he is sporting clean clothes on his head, but that would be a lie. Tuesday morning--the first of the three-day stretch--I cleaned the kitchen, made bread dough, and washed and hung two loads of laundry by the time HP went down for his morning nap. Normally, I am lucky to accomplish that much by dinner. The day felt surprisingly relaxed. We spent the afternoon at the park, finished planting the garden, and had dinner ready at 5:30. I should apply this same energy to keeping up with household tasks to the days when Henry comes home on time. I should, but I won't--at least not all the time. How could I appreciate the productive/organized days if there weren't the chaotic/messy ones to compare them to?